Sunday saw a thinning of sorts. Riff Rider, who went West with very little southing picked up the synoptic breeze first and largely escaped what would become the slow zone. Fast on his stern were JouJou, and Crinan II, who, both a little more south, managed to mostly escape the southerly surge and with over ground speeds from 7 – 11 kts, the three surged ahead of those less fortunate. Meanwhile, LIBRA, delayed due to autopilot issues, decided to drop out and the sea had it’s way with Mouton Noir and Elizabeth Ann, who both retired to the shores with equipment issues. We are down to 16. As the night fell, mother nature took pity on them and reached her fingers down to tickle the boats, one by one, and poked each in the direction of the finish. 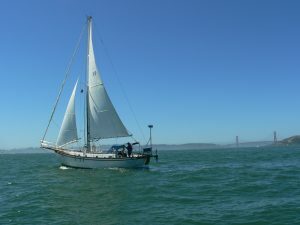 The breeze started picking up, as did speed, and boat by boat, the fleet started moving past the surge into solid northwesterlies. Right now it looks like good breeze all the way. Will it hold? Day 1 Summary – Ohhhh Noooo!!!! The dreaded southerly surge!!! 00:15 Sunday 6/24 – So it looks like the southerly surge that weather gurus were worried about has hit the fleet, with tracking report speeds dropping to 1kt and less. In the weather briefing provided by Skip Allan, at the skippers meeting, our fearless 19 were warned of this impending doom. Go west, he said. Here’s a quick why. So there is a Pacific high way offshore. There is a lower pressure system sitting over the central valley of California. Beyond the low pressure system are the Sierra Mountains. In the upper atmosphere, air can get pushed towards these mountains and some can’t get over them, it cools off, then wants to sink. As a result of this sinking air, a north/south troph associated with the low pressure system (actually, sitting between the low pressure system and the Pacific High) is pushed back westward off the coast. Exactly when this would happen, and exactly how far west was unclear. Light southerly wind lies to the east of the troph, light northerly winds occur to the west, and no winds in the middle. Guess where our buglighters are. 🙁 The no winds in the middle could last for a couple of days, so we’ll see. Stay tuned. At this time Libra is still in port, and Mouton Noir is returning to shore, reportedly possibly due to some equipment issues. There may be additional news from check ins, we’ll post any updates. Have a good night, and know the racers will likely at least have a peaceful night too, if they relax and enjoy the calm. It is lovely out there when it is calm. Posted on June 24, 2018 June 28, 2018 Author pueoCategories Crazy Rhythm, Crinan II, Dark Horse, Dolfin, Double Espresso, Elizabeth Ann, Fugu, Iris, Jacqueline, Joujou, Kynntana, Libra, Morning Star, Mouton Noir, Nightmare, Owl, Passages, Racer News, Rainbow, Riff RiderLeave a comment on Day 1 Summary – Ohhhh Noooo!!!! The dreaded southerly surge!! !